There are many activities that consume the time of someone who has set up a new business. There is the important task of gathering clients and seeking out new assignments. Then there is all the administration that goes with any business, whether new or old. Often new businesses have limited resources to help with administrative type tasks and these can also fall to the business owner. And without the structure of large organisations, administrative activities can become very onerous. Then of course there is the actually work that brings in the profit. It can be tempting, when a new business with limited on-going work, to send out many proposals for any work going that seems even slightly appropriate. However, this approach can be time consuming and it probably isn’t the best use of time. Any new business needs to decide what their unique selling feature is and what they really do well. They can then focus on the work that will have most likelihood of success. Rather than applying for many work assignments it may be better to concentrate on a few and provide high quality proposals. Decide where time is best spent and focus on these activities. 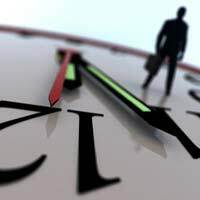 Allowing administrative tasks to consume too much time is costly so it's important to be efficient with the use of time as well as being strict with time management. It's important to also build strong client relationships. New businesses are very dependent on good customer recommendations, and being referred can make the task of finding new opportunities much easier. All businesses have a limited amount of time available so it is important to do some planning to ensure that time is well spent. Allocate time periods for work that needs to get done on a regular basis, such as responding to emails and completing administration. Decide how much time is needed each day or week for the activity and then stick to this firmly. Despite good intentions, it can be easy to let time slip when dealing with important emails and responding to request for information. Rather than guessing how much time is spent on activities, over a month, try to keep a track of where time is spent. This may also reveal time wasters. Sometimes it is not the best use of the business owner’s time to be doing all the activities of the business. If they are answering the telephone and responding to small email requests they may not be doing the tasks that would increase profits, such as completely work and writing proposals. Of course much of this will depend on whether the new business can afford it, but the business owner must decide when the cost of them not doing profitable work becomes too high and it would be more efficient to get someone else. There are many alternatives, such as hiring casual or part-time staff, or outsourcing to another service provider. Being organised can save the new business owner much time. Simple things such as keeping a proper filing system and an ordered desk can avoid wasted time. Whether this is taking advantage of any offers of help from family or friends, or grabbing opportunities such as often offered by local councils and new business government support services, these can help the new business owner develop skills and better manage their business. It can also free up his or her time. Plans are only of value if they are followed. Distractions are often a plans worst enemy. If working from home, ensure that other household members are aware of the business plan, and when they should and shouldn’t make interruptions. Be careful with other distractions such as Internet browsing. These can quickly consume more time than realised. Planning is great but things won’t always go as they should. New businesses need to be flexible so be prepared to relax your plan sometimes. A new opportunity may suddenly arise which demands all the business owner’s attention. New businesses often have limited resources and the new business owner can often find himself or herself wearing many hats. Their resourcefulness and talent are often what will make a business a success. Making good use of valuable time is essential and can mean having a good supply of work today and into the future.